Maximize jaw change-out efficiency with Allied-Gator's patented Quick-Change ™ Jaw Set Technology. When shifting from scrap metal processing to concrete crushing, many companies require multiple dedicated tools. 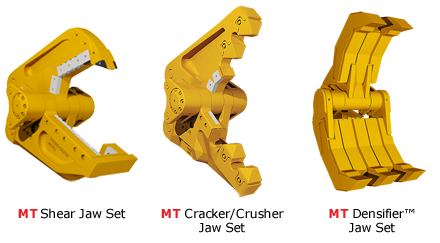 With the MT ® Series Multi-Tool, these costly hassles are eliminated by the use of pin-on Quick-Change Jaw Sets that can be changed in the field by the operator in as little as 15 minutes. The MT Shear Jaw Set can be used for the quick and efficient processing of structural steel and metal scrap. The MT Cracker/Crusher Jaw Set effortlessly processes concrete, cast and rail materials. 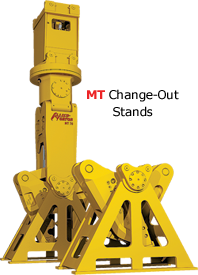 The MT Densifier ™ Jaw Set performs all the functions of a rotating grapple, but has the additional capability to condense scrap with unprecedented levels of power. In addition, both the Shear Jaw Set and Cracker/Crusher Jaw Set feature disposable wear components to maximize uptime and minimize maintenance.